While reviewing material on the 2012-13 NHL playoffs, I was struck by some funny elements in a photo of the Chicago Blackhawks printed in The Hockey News' 2013 commemorative issue that celebrates the Stanley Cup winner. Here's the photo in question. Almost everyone in this picture is proudly extending his index finger in order to proclaim, "Chicago's number one!" The main exceptions are two gentlemen in suits on the left-hand side of the photo. What's going on here? Did someone in the organization forget to clarify that they're planning to use one index finger for supremacy rather than signal "V for Victory" with an index-and-middle-finger salute? Maybe these two men took the "hockey as war" metaphor to heart and reasoned that, since making a "V" was good enough for Winston Churchill, this gesture ought to be good enough for the Chicago Blackhawks. The inconsistent use of fingers to celebrate the championship is made even worse by Marian Hossa's insulting hand gesture. 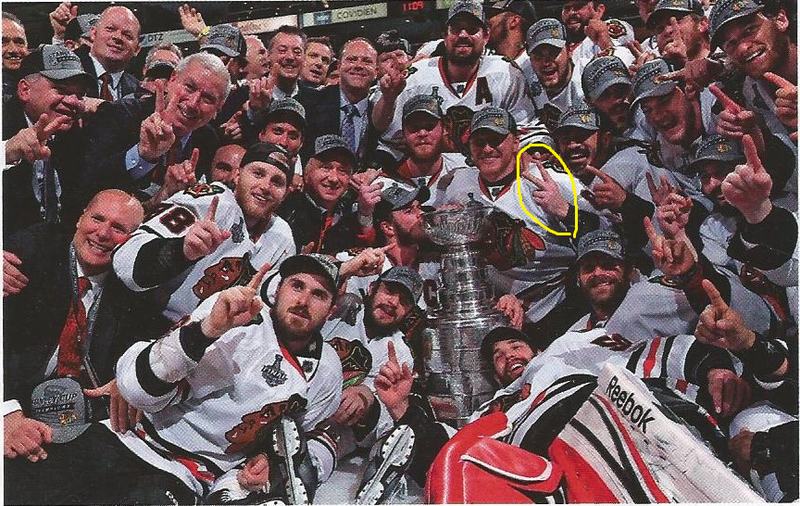 Yep, Hossa, who presumably sees that other celebrants are using two fingers instead of one, seizes upon the confusion to get away with flipping off the camera with the British equivalent of "giving the finger." There are many possible reasons why Hossa would exploit this historic moment to taunt Britons. Perhaps he's still bitter over Britain's indifference inaction following German occupation of Hossa's native Czechoslovakia in the 1930s. If that's the case, then Hossa's hand gesture and general giddiness might be meant to express the following sentiment: "I just annexed a British aristocrat's fine silver, and the limey bahstahds in England aren't going to do a thing about it!" Or maybe Hossa is also trying to do the "v for victory" but accidentally presented his palm in the wrong direction. Either way, this picture raises the following question: Why aren't the Stanley Cup runners-up forced to pose around a "loser's trophy" while holding up two fingers in shame? Don't the Stanley Cup champions deserve a commemorative picture capturing the defeated team as its players wallow in abject despair and hold up two fingers in deference to the champs? I don't see the point in winning if you don't have pictures to commemorate how your accomplishment humiliated the other team. If I were the Blackhawks, I wouldn't feel fulfilled unless my victory was followed up by a modern-day Roman triumph through the streets of Boston as well as Chicago. 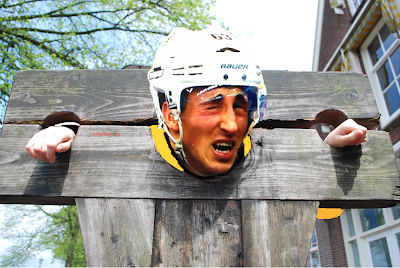 The parade would include Bruins such as Milan Lucic, Zdeno Chara, and Brad Marchand atop floats on which they'll be forced to stand hunched over in stocks. 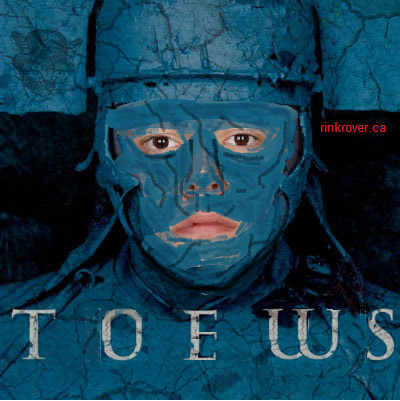 I'm pretty sure that half the league and 90% of NHLPA members would get behind making this picture happen. Parading the conquered team through Boston would make it known to Bruins fans that the Blackhawks have utterly owned their hockey market. I wouldn't, however, order the best of the enemy's warriors to be sacrificed as in William Shakespeare's Titus Andronicus. Of course, I'd also want part of the Blackhawks' triumph to include Matthew Broderick reenacting the famous parade scene from Ferris Bueller's Day Off. And that's why I'm not allowed to plan these things. Instead of insisting on every aspect of a Roman triumph, I'd just ask for the circulation of coins commemorating the victory. The US Government should issue some silver dollars that celebrate the champs and allow teammates to flip off the opposition. Aw, the sweet poor-sportsmanness of victory! Their particular trend regarding is going to be development regarding little laptops.